I’m Marco den Besten, 28 years old and I live in Hendrik-Ido-Ambacht or as we call it: ‘t Ambacht. It’s a village just below the city of Rotterdam. And I work in Retail. You know where you always have to be polite to people although you sometimes want to kick them out of the store, because the customer is always right. Good thing I got Lego to cool off. No just kidding, it’s not that bad! I’m also one of the History Moderators on Eurobricks, the perfect place for me as my building style is mostly medieval or fantasy! As for when I started the hobby? I’ve always seen it as just a toy, like Playmobil, until I discovered the Online Community back in 2010. 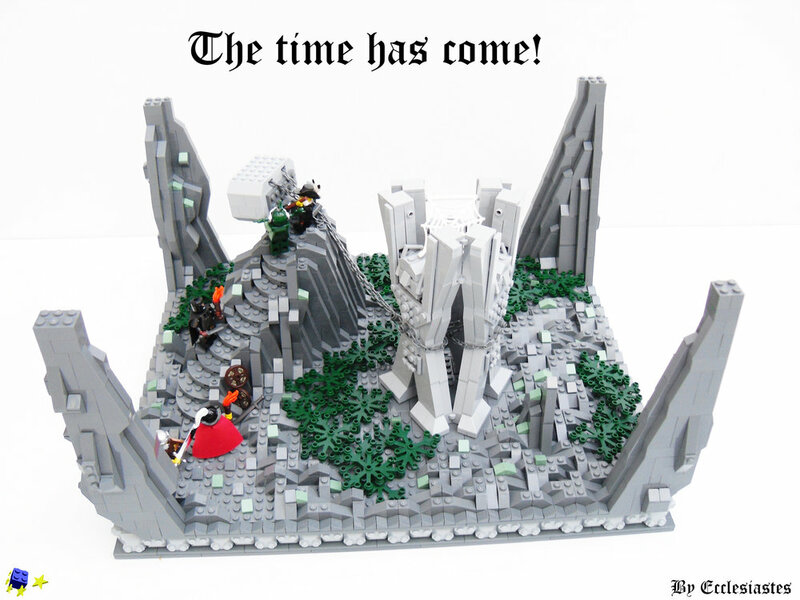 I came across several websites and was surprised that there were more people my age still building with Lego! They were having meetings en competitions, which I got into. So from that point on, it really started to become my hobby. That would have been the Imperial Flagship. And no, it’s not the 10210, which is nice and quite large, but it just isn’t as good as the 6271. It was such a beauty, just the right size and well detailed for such an old set. I got it from my grandfather on my 4th birthday and it just might be what got me hooked on Lego. The greatest appeal is to make your own world, where you decide what things look like and how it’s made. A big part of that are the minifigs. That’s what I enjoy the most, making new combinations out of minifig parts. This makes the torso’s tear when ripping out arms sometimes unfortunately, but that mainly happens with the older torso’s. And with the CMF series it’s even more fun to come up with minifigs that can inhabit my creations. Yes, I’m definitely a purist. When it comes to cutting, I’ve only cut hoses twice, as far as I can remember. But as it was something we used to do ourselves in the older Technic Instructions, I tell myself that’s allowed. No painting. Why would you want to do that with the insane amount of colors Lego has at the moment? And also no knockoff or third party stuff. I’m a Lego fan, not a brick fan that can use just everything that suits him. So limiting yourself to just original Lego forces you to be more creative, because of the lack of certain parts or colors and I like it that way! My favorite builder is Sirens-of-Titan. Unfortunately he’s not an active builder anymore, but back then he made things I only dreamed off. His builds were fantasy based, which made the appeal even greater. The way he used parts and the quality of his photos are still a great inspiration. Not in a way that I look back on when I’ve dismantled a MOC. But I do have “if I only packed it better” moments. The last time I had that feeling was with my Noriach castle. I brought it to Brickworld Chicago to put it on display. It came to the States quite well, but the journey back was probably rough because it was all smashed into pieces. I liked the style and I wanted to expand it a bit and make better photos of it. At my parents I slept in the attic, where the walls are slanted. This made it hard to put up proper closets for storage against the walls. So two years ago when me and my wife bought a house, I got the largest room to be the Lego room. (Yeah!!) Finally: straight walls and plenty of space. A dream come true! 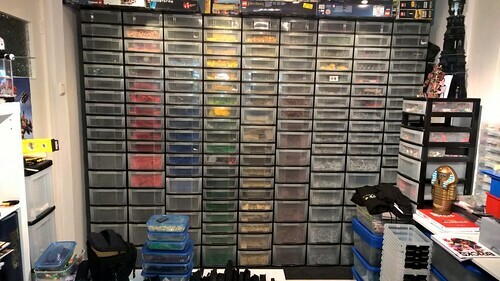 One of the walls became my Lego wall, filled with a lot of drawers with bricks sorted by colour and size. While I hate sorting, building goes a lot faster when you can find the right piece right away! No I don’t. Only time I did, was playing Legoworlds Beta. But I went back to real bricks pretty fast. I know which bricks I have and after looking at inspirational material I just start building. Yes, the week before the deadline of a contest or show. And somehow I build even faster after 10pm. I just stall building things until I really have to and it seems to work! Yes I do, all the time. And does listening to series count as well? Because it’s either music in the background or more often one of my favorite series on re-run. So for music, it would be something like Switchfoot or Needtobreathe or just music similar to Hans Zimmer’s work. And for series Scrubs or Community, which are just my two all-time favorite series. I just can’t get tired of it. Or anime, like Full Metal or Naruto (no not those horrible fillers). Works just as good as music! I keep most of my MOCs, because I need to put it on display at a convention. I try to attend about five conventions in a year. Most of my MOCs I don’t keep for conventions though, it’s that I just don’t want to start sorting again. I really hate it and I like to stall as long as possible until it’s inevitable to start tearing down MOCs for parts I really need. Do you have an all-time favorite LEGO set? That would be the 5988, Pharaoh’s Ruins. Of course the whole Adventurers line was fantastic, but this one from the first wave was just so complete. The Egypt based theme had a mysterious appeal and the set was quite large. Not to mention the awesome amount of minifigs, a car and an air balloon. It’s just the ultimate play set. Also definitely worth mentioning, everything was printed! No horrible stickers that you find way too often in sets these days. That would be one of my early creations: Elymas. It’s quite old, but to me everything in it was just right back then. And looking back at the photos, I think it still is. Back then, Dark Brown was quite a rare color, but I had just enough to work with and it worked perfectly with the other dark colors. I was also pleased with the minifig combos and vegetation. I actually took it apart just a year ago, because I needed the parts. Still wished I didn’t. Maybe I can re-build it one day and give it a good spot in my Lego room. Well that would be a “self portrait” I made for someone that did a study on hobby behavior. It’s not the case anymore since I don’t live at my parents anymore, but I did sleep on the floor occasionally because my bed became a building area. It is still the case though, that when I’m working on a project bricks lay everywhere and of course I still dream or fantasize about large projects!